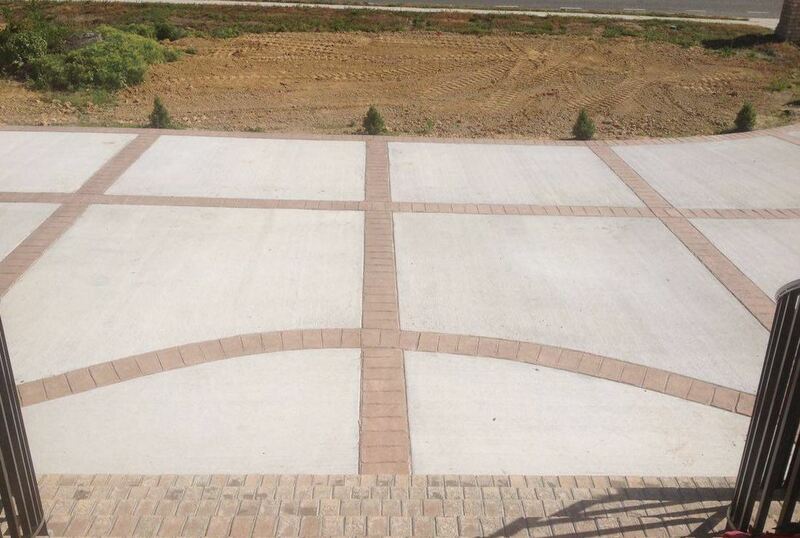 New paver patio or driveway is what you're looking for? Good, because we're your one stop shop! From the estimate to the completion of your project, we will guide you through the whole process. ​There are a variety of uses for Concrete or Stone Pavers. The sky is limit on the things you can do to make your home look unique and truly “yours.” For one, pavers add a level of curb appeal that can set your home apart from the rest. The use of pavers basically rolls down to creativity! With so many uses, choices in types and colors of pavers, it can be difficult to pass this option by without at least some thought to use it. Some of the more common ways to use pavers is for driveways, outdoor patios and walkways. Hand setting your pavers is a painstaking process that requires a lot of preplanning, good math skills and a lot of time. Rushing through a paver job will look sloppy of you try to do it in a hurry. Sometimes, around properties and foundations, pavers will need to be cut down, to make it look like a continuous thought. Otherwise, stopping the pavers short may make your project look unfinished. Another quite popular use of concrete pavers is to use them to build a fire pit in your backyard. Fire pits are a great place to create family memories, entertain guests, or enjoy a quiet evening on a crisp fall night. When you decide to lay out a fire pit, consideration for landscaping and existing nature should be important things on your list to think about. It’s wise to not construct your fire pit too close to existing trees, where embers could rise out of the fire and singe the leaves, or have your fire pit sitting too closely to where you could burn expensive landscaping planted nearby. You will also need to think about what type of paver you might want to use. Fire pits made of bricks are great, but fire pits that are built with stone or concrete pavers offer more variety, as there are many choices in additional seating that can be placed around the pit to enhance the seating area. Another popular use of concrete pavers is around ponds and pools. Some homeowners prefer the usage of Concrete and Stone Pavers around a property because it looks better maintained, adds additional value to the home and makes the landscaping around the pool stand out. Concrete slabs around pools are common, so when you see a paver pool deck around it, it tends to stand out. Man-made ponds also have this same draw. When you see a pond in someone’s yard that appears to have been built up using dirt and plastic pond pieces, it doesn’t stand out nearly as well as a pond that would be enhanced with the different kinds of paver stones. A large choice in color of pavers makes the ease of choosing this option even easier. Instead of going with the usual “grey” or “red brick” you can choose shades of browns, tans or customized color choices, depending on how much you are willing to spend. Gardens around the home also benefit from the use of concrete pavers. Personally speaking, I think a garden or sidewalk that is lined with flower beds that have been outlined with stone pavers, looks more finished that flower beds and gardens with no edges. One of the nicest things about these sorts of pavers is the ability to choose contoured pavers that can trim a flower bed at the base of a tree, or scalloped pavers that can be planted a mere inches out of the ground, along the garden or flower bed’s edge, to outline the very outer edge of the bed. Often times, you will find it to be common practice to see pavers that are layered several rows high, in order to build up the flower bed or garden. These concrete or stone pavers can be purchased in a variety of colors, sizes and shapes that give any DIY homeowner or project engineer decisions to choose from, to make the project stand out. It all depends on how much you are willing to spend on the project from start to finish. One of the only drawbacks in using paver stones is the cost. Depending on how many you choose to purchase at one time or how many you need for your project entirely, the costs in materials alone can deter many from using this as a unique way to accent their home. If you have a very large project and intend to lay it with Concrete or Stone Pavers, it can be very expensive, without the consideration for labor costs. If you can afford the expense, it can last for a long time and make you very happy that you went with the decision to go with it, in the end.